Reflecting on the past and discerning how the church faces the future was front and centre of the 33rd Synod meeting (20–24 October). The team from Journey reports. Hundreds of Uniting Church members gathered at the Alexandra Park Conference Centre on the Sunshine Coast as the 33rd Synod in Session kicked off in style with a rousing opening worship of music and dance by young multicultural church members. A video produced by Newlife Uniting Church (Robina) was presented during opening worship, reflecting on the church’s 40 years of life and what lies ahead as the baton is passed to future generations. This theme encapsulated much of the discussion and discernment which took place over the following four days of Synod: what course is being set for the future life of the church? During his sermon Rev David Baker—who was re-inducted as moderator for another three years—acknowledged that while the church undergoes a period of transition, being able to listen deeply is crucial. “There is an anxiety about the vitality of the church … things do need to change,” said David. 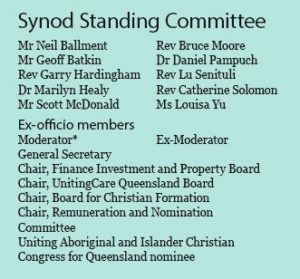 Queensland Synod office: what’s happening? In her first report to a Synod in Session as the general secretary, Rev Heather den Houting outlined a number of the activities and strategies underway at the Synod office over the past 18 months. The result (service, leadership, sustainability and collaboration) has formed the basis for the organisational restructure which has taken place in the Synod office. Heather thanked the executive management team and spoke of the evidence-based data that is informing some of the work and decision making for the Synod, particularly the Strategic Mission area headed up by associate general secretary Rev David Fender. She encouraged Synod members to read the #realunitingchurch report: A report on Synod-wide mission implementation strategies 2016–18, which collates a myriad of information from across the Synod office and provides an overview of operations, risks and strategic framework. 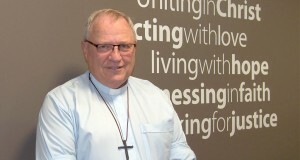 Heather said that the Synod office transition means there is no longer a FAPS (Finance and Property Services) department, but that these functions continue in other areas. She said that as a result of the Royal Commission there is an increase in civil litigation against the Synod. There are no leave passes when it comes to the safety of people, Heather added, saying that she was unapologetic about her “hard line” on blue card and safe ministry documentation. Since 1999 the Queensland Synod through UnitingCare Queensland has recognised the outstanding commitment of volunteers through the Moderator’s Community Service Medal. UnitingCare Queensland outgoing CEO Anne Cross and moderator Rev David Baker presented the awards to five out of the 15 individuals who were able to attend Synod. This year’s recipients were Dr Robyn Pugh, Jean Graham, Thelma Aslett, Jan Newcomb, Janet McCulkon, Bernice Peterson, Phillip Gibson, Jean Nissen-Wiis, Roger Dennis, Arnold and Avis Eggins, Terry Foley, Beryl Cook, Merle Edwards and Jean Keys. 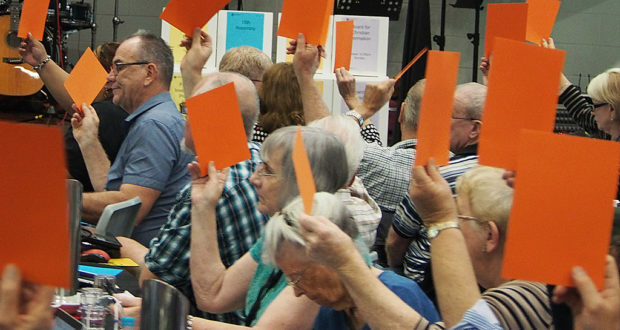 As the third evening of the 33rd Synod came to a conclusion, members rose to their feet to sing “Lift High the Cross” as the Celebration of Ministries commenced. 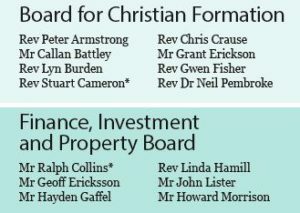 Minutes of appreciation were received for retiring ministers: Rev Christopher Barr, Rev Russell Clark, Rev Dr Malcolm Coombes, Rev David Fanning, Rev Lynne Gibson, Rev Robert Harriman, Rev Ivan Kirk, Rev Russell Knight, Rev Raymond Nutley, Rev Bruce Raymond, Rev Jenny Sims and Rev Ian Smallbone. 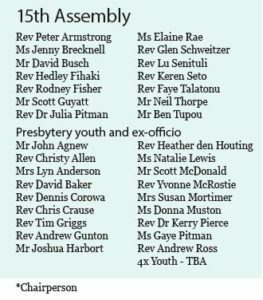 Trinity College Queensland principal Dr Leigh Trevaskis introduced those ordained since the 32nd Synod: Rev Nathan Barton, Rev Michelle Cullen, Rev Sharene Fechner, Rev Aaron Moad, Rev David Nix, Rev Glen Schweitzer, Rev Beatriz Skippen, Rev Janet Staines and Rev Adam Tipple. Memorial minutes were presented for ministers who have passed away since the 32nd Synod: Rev Wilfred Blake, Rev Dr Judith Dalton, Rev Richard Diffin, Rev Jack Frewen-Lord, Rev Arnold Gates, Rev Raymond Hunt, Rev Douglas Kirkup, Rev Francis Le Bherz, Rev Douglas McKenzie, Rev Margaret Mills, Rev Robert Morgan, Rev Albert Quant, Rev Phillip Ramsay, Rev Gordon Robinson, Rev Graham Ross, Rev Edward Smith, Rev Prof Han Spykerboer, Rev Brian Wells and Rev Maxwell Vines. Wesley Mission Queensland (WMQ) superintendent minister Rev Lyn Burden and CEO Geoff Batkin used a number of personal stories via video in their Synod presentation to highlight the organisation’s ongoing commitment to reaching vulnerable people. Their report noted that the activities since the 32nd Synod have taken place within the context of one of the most profound periods of reform and structural change for the aged care and community services sectors in 30 years. Along with the re-branding of Wesley Mission Brisbane to Wesley Mission Queensland, WMQ has continued to expand its services and to explore flexible and innovative models of care. Geoff introduced some of the new projects since last Synod, including the establishment of Hummingbird House, Queensland’s only children’s hospice and Asher House, which is home to 12 young people living with high-care needs. Synod also heard about WMQ’s plans in the aged care sector, with an expansion underway at John Wesley Gardens in Brisbane and the construction of Dovetree at Sinnamon Village. “Buildings are really important in residential aged care but what’s far more important are the hands, the feet, the staff, the volunteers. It’s all about relationship, it’s all about getting to know the person, what matters to them, what brings meaning in their life,” said Geoff. Similarly UnitingCare Queensland (UCQ) talked to how significant change in the health, aged care and community services sectors continues to impact every aspect of the organisation. Since the 32nd Synod, UCQ has completed a three-year strategic plan as well as aligned business and culture plans and commenced the massive task of integrating its corporate support functions previously operated by Blue Care, UnitingCare Health and UnitingCare Community. Outgoing UnitingCare Queensland CEO Anne Cross spoke about the process of transformation in the context of the marketisation of services, consumer-directed choice and increasing contestability of contracts in those services still directly funded by government. “We are undertaking significant work to understand what our clients, our patients, our residents want and need from us, and to see their experience through their eyes. We have and are reviewing service models to ensure that we are able to respond quickly to emerging needs and well-positioned to deal with sector changes,” she said. 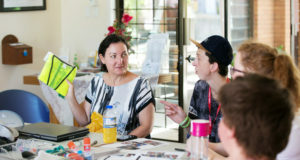 Anne highlighted the organisation’s work with the Queensland Government on the Newpin Social Benefit Bond, a new model of funding for social services which will operate in three sites across Queensland. The first centre will open in Cairns in 2018. Anne said that UCQ was continuing to renew its aged care facilities, including building on Thursday Island, Mackay, Alice Springs and in Darwin. Anne was honoured for her 14 years of service by a Minute of Appreciation. The new CEO, Craig Barke, joined the UnitingCare Queensland Board in 2011 and was appointed chairperson of the board in 2014. Anne also presented the Norman and Mary Millar lecture in a thought-provoking session on the history and future of church agencies. 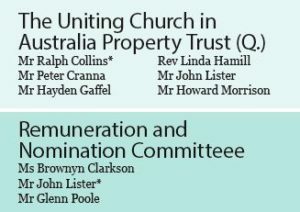 After much discussion, both on the floor and in small groups, about marriage and the Uniting Church’s position on the issue, the proposal for the Queensland Synod to call on the national Assembly to affirm the sanctity and uniqueness of marriage between man and a woman was not passed because it was agreed not to make a decision on the proposal at this time; it was resolved the information and discernment from the 33rd Synod will be provided to the national Assembly in addition to the conversations had around marriage that were requested by the Assembly. 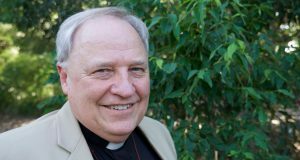 Elsewhere a proposal to disband the Legal Reference Committee was defeated; the proposal to establish two new committees of the Synod Standing Committee—the Remuneration and Nomination Committee and the Audit and Risk Committee—was passed; a proposal to set the moderator’s term of office to six years to take effect from the induction of the next moderator was withdrawn; and a proposal was passed that the Synod strongly encourage congregations to engage in constructive dialogue and fellowship with local communities of other faiths.